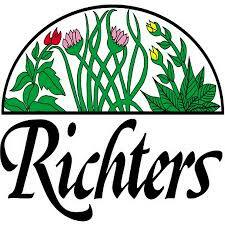 A bus trip leaving from Toronto at 9 a.m. and returning at 6 p.m. to explore the history and use of herbs at Richter’s Herbs in Goodwood, Ontario and the Parkwood Estate in Oshawa, Tickets are available on Eventbrite. 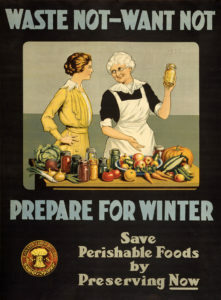 Detail from a WWI propaganda poster produced by the Canada Food Board. Did you know that the average Canadian consumer throws out an estimated 170 kilograms of food a year? As a matter of fact, Canada is among the worst countries globally in wasting food. This issue is not only a matter of what is left at the back of the fridge, but also encompasses the entire food-supply chain, from the farm all the way through processing, distribution, food service and retail. How did we get to this and how did we deal with food waste in the past? How can we individually make a difference? How can the food-supply chain reduce its footprint? The presenter, Magdaline Dontsos, is a former faculty member in the Food and Nutrition Management program at Centennial College, as well as a member of the Ontario Society of Nutrition Management and the Canadian Society of Nutrition Management. Admission is $15, and food samples made from recovered food waste will be served. Tickets are available on Eventbrite. CHC celebrates a royal bicentennial with a festive event, including a full tea highlighting appropriate historical recipes. Fiona Lucas (co-editor of the recently published Catherine Parr Traill’s The Female Emigrant’s Guide) will discuss Victorian teatime traditions, and professional Royals-watcher Patricia Treble of Write Royalty will discuss our fascination with Queen Victoria and her descendants then and now. Fascinators de rigeur! Admission: $20. Tickets are available on Eventbrite. Rose Murray, CHC Lifetime Member and Edna’s friend, will reflect on the life and food writing of this illustrious Canadian culinary icon, with lunch cooked from Staebler’s books, such as Food That Really Schmecks. Details to follow. Tickets will be available on Eventbrite. CHC is a sponsor of Taste Canada, Canada’s only national, bilingual food writing awards. Tickets will be available starting in May 2019 when the shortlist is announced. CHC board member and historic cook Sherry Murphy will lead the fourth annual hands-on exploration of seasonal recipes dating from the Victorian period.